Emilia Lara knew she needed to be involved in her son’s education. One thing she didn’t know is that as an English learner, her son needs to be reclassified before he can take the classes that will help him get to college. Nearly a quarter of all LA Unified students are English learners, meaning English is not their first language and they are not yet fluent. The district’s goal is for these students to master English. Until a student is reclassified, he cannot take what’s called A-G courses in high school. Students must pass these courses with a D in order to earn a high school diploma. They must earn a C or better in these classes to be eligible to apply for the state’s public universities in the University of California and Cal State systems. Lara, whose son is not yet reclassified, said she started getting involved in her son’s education because he has special needs and is in a special education program. She spent many years advocating for her son to receive the appropriate support. Only later did she realize she also needed to make sure her son can reclassify as soon as possible and what is required. “I have learned so much in the last three years. 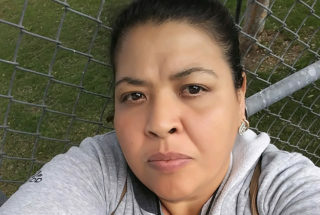 I used to miss school meetings, so I wasn’t aware that my son needed to reclassify to be able to take all English classes so he can take the same classes other students are taking already,” Lara said. The process to become reclassified requires four steps: the student must pass the state’s English Language Proficiency Assessments for California (ELPAC), pass a teacher evaluation, receive parents’ consent, and the student’s English proficiency must match the average level of other students. She said she is not alone and that there are still many parents in her community in South Central LA who are not aware of the reclassification process. Sometimes they are finding out too late about the reclassification process and why it is important for their kids to reclassify. They are not aware that not being reclassified puts them behind in their path to graduate from high school. Lara has joined other Carver Middle School parents to form the Parent Problem Solving Group that started this year at the school. Three of these groups launched this year in board member Ref Rodriguez’s District 5 to bring parents together to identify problems at their schools and form solutions. Their plan will center on training other parents to support their students in the reclassification process. “I came to this country over 20 years ago to support my parents, my family. Now that I have children, I want him to have a good education so he can have better opportunities in life,” Lara said. She has another son attending West Vernon Elementary. What is your preliminary plan for your school’s parent group to address regarding reclassification? I think just the fact that parents can hear more about it and learn would be a big step forward. We would like to see TV ads or people on TV talking about it in the shows. Sometimes we don’t read the flyers. Maybe more workshops for parents available in school. We’d also like to be informed about what is discussed on this topic at the board meetings. We know sometimes they make decisions about reclassification and we should be aware of that. What else would you like parents to be aware of about reclassification? We need to be involved to demand the support our kids need to reclassify. The sooner they are reclassified the better, but we also need to make sure they’re learning, that they can be ready to do well in English-only classes. The only way to do that is if we ask questions. We need to be clear what exactly we need to support our kids. What goals do you have for your kids’ education? I want for them to feel safe in school because in our neighborhood there’s so much violence, gangs, a lot of homeless people, prostitution. And they know that, sometimes my kids don’t even want to go to school because they feel unsafe. My dream for them is to get a good quality education so they can continue with higher education, and go to college because without a good education you can’t do much in life. I want them to graduate prepared for a good job. I dedicate all my time to taking care of my son with special needs. I don’t have a full-time job, so I volunteer every day at school to be vigilant about how they do in school and also to motivate other parents to be involved in school as well.